The design of the Protech Godfather automatic was influenced by the original Italian Stilleto knife and comes with Protech's own bayonet style blade .The Godfather is an automatic side opening knife that is Overall Length: 9.3", Blade Length: 4", Blade Thickness: .125", Blade Steel: 154-CM, 59RC, Closed Length: 5.3", Handle Thickness: .485", Weight: 4 oz. 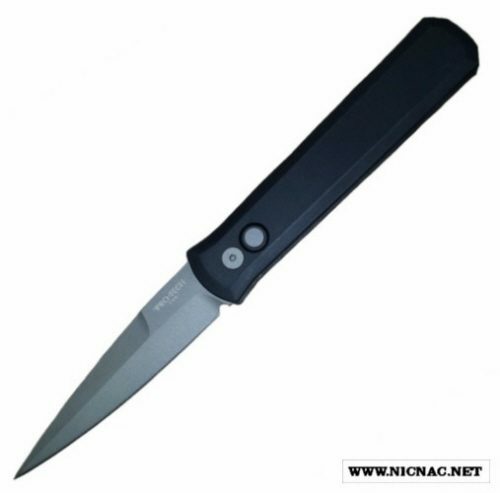 It features a coil spring that opens with a snap that will truly please time and again for years and carries a limited lifetime warranty, as do all ProTech automatic knives. Made in the USA.